Traveling with e-cigs and e-liquid on a plane isn’t something anyone wants to really waste much time thinking or worrying about. The TSA guidelines for traveling with liquid apply to nicotine e-liquid as well. In the event you’re still wondering if this info is accurate, the TSA’s blog post about e-cigs and traveling aboard planes will certainly calm your fears. As far as using them while flying, we suggest you contact your airline and see what they have to say. Though most airlines don’t approve of it. URGENT UPDATE: April 13, 2016 – There is a new law being proposed that’s going to prevent everyone from carrying/transporting any and ALL electronic cigarette products. You will not be able to take any vape hardware with you. Not even in your carry-on or checked luggage! As of January 2017, this law is not in effect and as of now you can still travel with e-cigs and e-liquids. PLEASE READ our updated post about the new law proposed that will ban ecigs on planes. Fight for your right to vape! Share ECCR articles on your social media and join CASAA. New rules for air travel with electronic cigarette batteries. Revised TSA guidelines announced in November 2015. No ecig batteries permitted in checked baggage. These rules were implemented due to concerns regarding fire hazards involving low quality, unregulated cape devices and low quality lithium ion batteries. At this time, there aren’t any. You’d think there would be, but there really aren’t. However, there are rules for liquids of any type. Since you’ll likely be traveling with your Halo Triton, Apollo eGo, or another mod-type e-cigs that requires a clearomizer tank – you’re most likely going to be traveling with e-juice. You’ll have to follow their guidelines for “how much” you can take. Don’t worry though…they’ve made it a tad bit easier than you think. The TSA has a rule of thumb they go by. It’s called the 3-1-1 carry-on rule. Ever heard of it? Well, it basically outlines very clearly what you need to do with your liquids. You can read more about their 3-1-1 carry on rule here. If you do a little bit of research, you’ll find out there are very few people that had any difficulties with the TSA concerning their e-liquids or e-cigarettes in general. To be a little bit more precautionary, don’t declare these items for inspection at the checkpoint. If you know you’re not carrying anything suspicious or illegal, let the TSA do their job and go on your way. If they should raise an eyebrow, let them know it’s nicotine e-liquid for your e-cig – but don’t bring attention to yourself if it’s not necessary. You can travel with e-cigs on a plane but the FAA has told airlines that lithium ion vape batteries are a fire hazard. Therefore no e-cigs allowed in checked bags. You must travel with your e-cigs as carry-on. You can travel with e-cigs either on your person or in your carry on bag. If your carry on bag has too be checked at the gate, you have to remove your e-cigs and any spare batteries before your bag can be checked. E-liquids are allowed in checked bags as long as the meet the 3-1-1 standards as indicated in the diagram above. Your batteries and charger can go in with your laptop case or with your other electronics. We also recommend disconnecting the batteries from their atomizers when going through the check point. You’re bound to set off an alarm, and it’s a lot easier to just hand them something than to have them treat you like you’re a criminal trying to pull some tricky stuff. Point being – don’t make your bulky e-cig look like a pen bomb/pipe bomb or even take one that resembles anything like one. Also take it apart for the sake of getting through TSA smoothly and reassemble it on the plane. As for your batteries, cartridges, clearomizer tanks, and whatever else – unless you’re taking an unreasonable amount, don’t sweat it. The TSA doesn’t currently have any restriction on e-liquid, or e-cig products. Just make sure that the e-liquids are secured in a zip-top, clear plastic bag. In the unlikely event that you can’t take your e-cig with you, a really good recommendation is that you take a self addressed envelope large enough for your e-cig with you so that you can mail it back to yourself if you can’t take it through the checkpoint, which is very unlikely to happen. Better safe than sorry. Don’t Use Your E-cig On A Plane! The U.S. Food and Drug Administration (FDA) has often claimed that the vapor produced from e-cigs and vaping technology is enormously high in trace metals. However, a new research study conducted by scientists from Tennessee’s Lincoln Memorial University (LMU) and Missouri’s William Carey University (WCU) seems to refute these previous claims almost entirely. Furthermore, the researchers offer some rather interesting theories as to why and how agencies like the FDA can make such ridiculous claims in the first place. The vaping industry has created jobs and a vast number of business opportunities, hence has had an immeasurable impact not only on public health but also the world’s economy, and yet, is facing a serious threat from the FDA. In the last ten years, electronic cigarettes have exploded from non-existence to a $3.5 billion industry. A recent report by the Orange County Register showed that the number of stores selling e-cigarettes in Los Angeles County has risen by 34% from 2013 to 2016. Additionally an increase of 21% was reported in Orange County, 15% in San Bernardino County and 9% in Riverside County. The infamous deeming rule implemented by the Food and Drug Administration (FDA) has rocked the vaping industry and has led to the demise of several small well meaning vaping businesses, most set up by ex-smokers themselves who have smoking cessation at heart and a motivation to share the products that helped them quit. On the other hand the FDA insists on demonizing vaping products and classifying them as tobacco products. The closing down of the small vape shops that cannot afford to pay the ridiculous licence fees imposed by the agency, is leading to big tobacco, (who are now also branching out to vaping products), having the market all to themselves once again. A move that is detrimental not only to public health, but also to the economy, as the rich tobacco companies get richer, and small vape shops and their employees are finding themselves out of jobs. The evidence is as clear as crystal, vaping is at least 95% safer than smoking. A figure that was first released by Public Health England, and then confirmed by several other studies. While this data has been successfully endorsed by the UK, and is currently being reviewed by other countries, the US has been consistently refuting it. 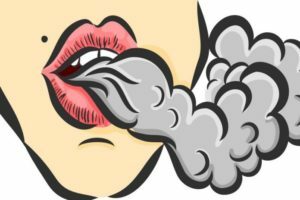 Is vaping bad for you? Depending on what you read, you might think that vaping is as safe as breathing clean air, or that it’s just as bad as smoking cigarettes. Neither of those things is correct, of course. The truth is more nuanced, but it isn’t somewhere in the middle either. When we judge the risks of vaping, we’re typically looking at relative risk. We’re comparing vaping to smoking, which is usually what vapers did before they began using e-cigarettes. There’s not much reason to compare vaping to clean air, since most vapers would be smoking if vaping didn’t exist. That doesn’t mean we shouldn’t try to learn the specific dangers of vaping though. If there are dangers hidden in e-cigs, most vapers would like to know what they are. Maybe the products could be modified to avoid the potential risks, or maybe smokers could find an even safer source of nicotine like smokeless tobacco. Let’s look at how vaping affects the areas of the body that are damaged by smoking, and examine the evidence about potential disease outcomes.